That's how I would describe our trip to The Vintage Barn Show. We have been referred to in the past as the Dynamic Duo, and even without masks and tights, we earned the title this weekend with our " divide and conquer " methods. And what a blast!!!! These are a few of our fantastic finds. We spent the first three hours of the show shopping frantically, and the last four or so hours hauling and packing, and generally having the time of our lives! By the time we left, we were hot, filthy and pleasantly exhausted. A little dinner, a little air conditioning and we were ready for day 2. We chose to spend day 2 at the flea market in the parking lot of our friend Celeste's restaurant, Chaps, in Spokane. We picked up a few more goodies, had a fantastic lunch at Chaps and headed for home with a full trailer. What a successful weekend! Re Use * Re Purpose * & Re Invent! Have you seen my new architectural salvage corner of the shop? 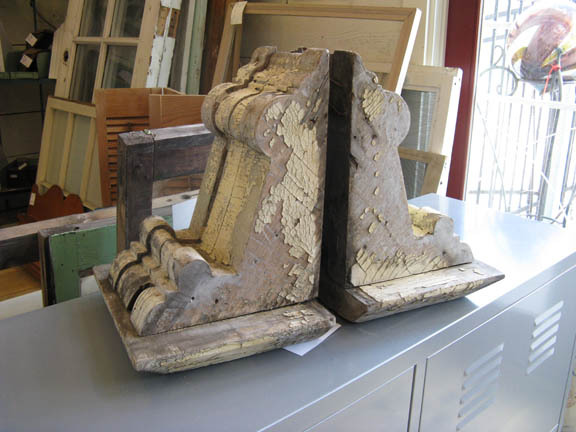 I am so excited to have some fabulous new finds, like windows and screens and huge corbels! These corbels would be fabulous as a shelf in the kitchen or with a piece of glass on top as a shelf in the bath! I can never have enough architectural elements in the shop, so Rachel and I are headed out this weekend to the Vintage Barn Antique show and we're looking for great architectural salvage on the way to and from! Idaho here we come, so watch out for these Montana gals from Station 8 ready to climb up in the rafters and poke through cobwebs to get to the good stuff! Can't wait to tell you all about our success on this little buying trip!and maybe we'll see you there! !